Apple is worth more than any other company on Wall Street. Google owner Alphabet is right behind it. The two are fierce competitors in the world of mobile phones, media and connected home speakers -- among many other things. But which stock has been the better buy? 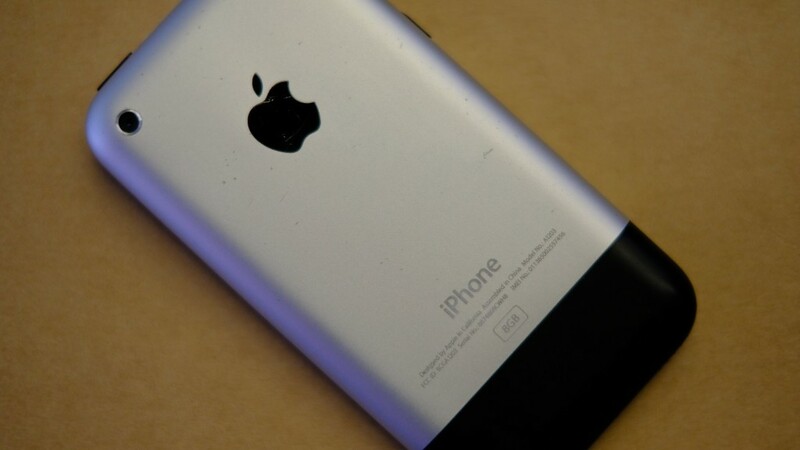 If you go back to the debut of the first iPhone ten years ago (the first Android -- for T-Mobile (TMUS) -- came out a year later) then the answer is clearly Apple. Shares of Apple (AAPL) are up an astonishing 747% since late June of 2007. Only ten companies in the S&P 500 have done better during that time frame, including other big techs Netflix (NFLX), Priceline (PCLN) and Amazon (AMZN). 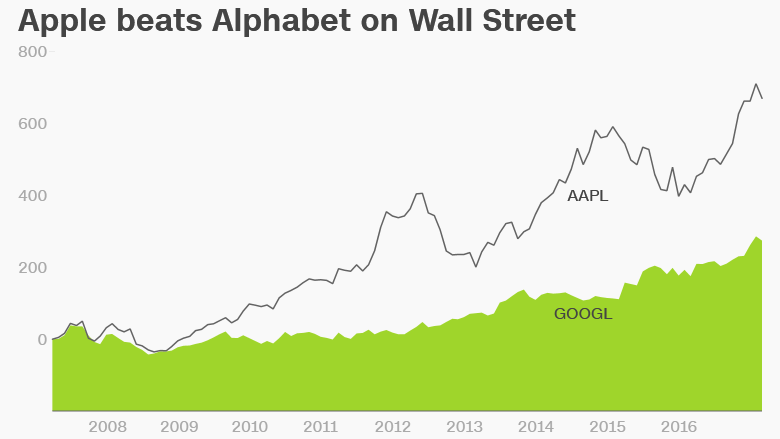 Alphabet (GOOGL) is up more than 265%. Not too shabby either. The parent company of Google has outperformed the broader market and it's done better than rival Microsoft (MSFT) as well. But what now? Both stocks are up more than 20% so far in 2017. Investors clearly feel that the two of them can continue to do well even as they go head-to-head in many markets. Hank Smith, co-chief investment officer with Haverford Trust in Radnor, Pa., owns Apple and still likes the stock -- especially since it now pays a healthy dividend that yields 1.8%. Google does not pay a dividend. Smith said that investors are obviously eager to see what exactly the next iPhone, due out later this year, will look like. But he said that people shouldn't ignore the fact that Apple now gets a decent amount of revenue from apps and other services. "As we wait for the next big thing, investors overlook the growth on the services side," Smith said. "All the apps are integral to the equipment and hardware business for Apple." But another Apple investor said that he's a little wary of the stock -- and other big techs for that matter -- because of how dramatically they have run up in the past year. Wall Street's sales expectations for new products may be too high. "As a long-term investor, I still like Apple. But it has had a heck of a run since last May," said Trip Miller, managing partner at Gullane Capital Partners, a hedge fund in Memphis. "The market is pricing in such a strong debut for the next iPhone and the home Siri speaker. I wouldn't be buying more Apple stock today," Miller added. Apple is no longer as cheap a stock as it once was, either. Shares trade for more than 16 times this year's earnings estimates, which might be a little rich given that profits are only expected to grow around 8% annually, on average, over the next few years. But Apple is also sitting on a $256.8 billion pile of cash (held mostly overseas for tax purposes) that could one day be used to boost its dividend, buy back stock or acquire other more rapidly growing companies. So what about Alphabet then? Its stock is even more expensive, trading at 28 times earnings estimates for 2017. Yet some would argue that the Google owner is worth every penny since it's not as mature a company as Apple and has more diverse revenue streams. To that end, analysts think Alphabet's profits will rise at a nearly 20% clip during the next couple of years. Gary Bradshaw, a portfolio manager with Hodges Capital in Dallas, said he owns some shares of Alphabet but that he hasn't added to the stock in a while. And he notes that there is more to tech obviously than Apple and Google. His two favorite tech stocks? Facebook (FB) -- which he thinks is still a bargain thanks to its 2 billion user base and expectations of nearly 30% profit growth for the next few years -- and Microsoft (MSFT), which he says has been "reinvigorated" by its cloud business. Of course, investors haven't gone wrong by buying any of the giant tech stocks lately. Apple, Google, Facebook, Microsoft and Amazon (AMZN) are the five most valuable companies in America. And they have all soared this year.